Raising a years worth of food is something I get asked about quite a bit, especially what it takes and what’s involved. Today we’re going to dive into some common myths people have, both in regards to gardening, but especially when it comes to producing enough of a crop to take you and your family through an entire year. Listen below to Episode #136 of the Pioneering Today Podcast,where we teach families how to grow, preserve and cook their own food using old-fashioned skill sets and wisdom to create a natural self-sufficient home, with, or without, the homestead. When it comes to gardening, you’re going to find almost everyone has an opinion and loves to share it, which can be good or bad, depending upon who is giving the advice. Just like anything, you have to take advice with a grain of salt, and decide what is going to work for you and your garden right now. I’m a huge fan of testing things to see how it works for me and have tried a lot of common gardening advice. One thing I do when testing is if I know we’ve been having relative success with one a crop, I only try a test out with a small amount of it. This past year I tried some new tomato varieties and while they were fun table eating, I was a bit short on our tomato sauce. This year I went back to our regular amounts and varieties. 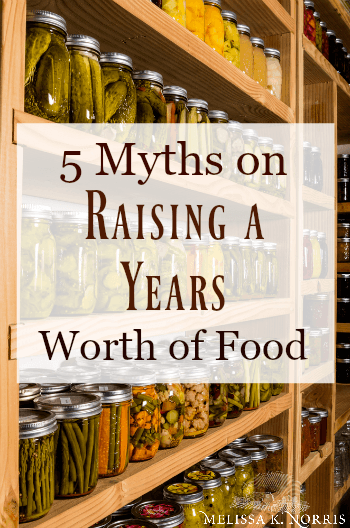 I thought I’d share today with you some common myths people have when it comes to raising a years worth of food for their family. People assume you have to a really large yard or acres of fields to grow enough food to take you through a whole year. This is not entirely true, if you were planning on growing a years worth of every single thing your family ate, then yes, but we grow close to 50% of our fruits and vegetables for the year in just our yard. Specifically, we’re able to grow a years worth of tomato products, talking all our own salsa, tomato sauce, pizza sauce, canned and dehydrated tomatoes for a family of four in a 10 by 20 foot area. That’s the size of just a small patio. We grow paste tomatoes, because from a preserving standpoint, a paste tomato is going to give you a large volume of product with the smallest amount of hands on time when making sauce. With just 20 paste tomato plants, we grow heirloom San Marzano Lungo’s, I get enough harvest for fresh eating and all our preserving needs for the entire years worth of tomato products. The rest of our garden space for our main summer annual summer vegetables is a fenced area in our back yard of 20 by 40 feet. Nada. While a green house can be a lovely addition to your food raising efforts, it’s not necessary, especially not for starting seeds. Seeds and seedlings are pretty little, if you’ve done your timing right, there’s no need to grow them to full size indoors. I grow all of our tomatoes from seeds in a 2 foot wide by 4 foot long section in our living room, and that includes the grow light. We do use an off-grid green house, meaning no heat or electricity, just greenhouse plastic, to grow our tomatoes. This is because we live in the Pacific Northwest and blight is a real issue with our rainfall. I don’t start any of my seeds in it and did grow tomatoes without out. We made it ourselves and its been the only way I can eliminate blight. Oh friend, I get busy. This homesteading mama worked a day job, put in 30+ hours a week at the same time on this podcast and blog, and still ran a fully functioning homestead with my husband and two kids, cooked meals, cleaned house… ya get the picture. Does it take some time to grow your own food? Yes, it does. Does it take a ton of time? No, it doesn’t. We average about 1 to 2 hours a week during the growing season. Divide that out and it’s as little as 10 to 15 minute a day to raise your own food. You spend more time than that on Facebook. There are a few times of the year you’ll need to spend more time. These are generally once a year or even once a life time occurrence. If you’re putting in a brand new garden bed or green house, you’ll probably be spending close to a full day, but once it’s in, you’ll only have minimum maintenance. When we plant our annual garden in the late spring, it takes us about 2 to 3 hours, but that’s only once a year. Myth busted! We raise all of our own meat (talking grass fed beef cattle, organic pork, meat chickens we butcher ourselves, and laying hens) and we are gone at least two full weekends every month during the summer and a full week for our yearly family vacation. Vegetable garden- we make sure the garden is well watered before we leave on Friday and its the first thing we water when we get back on Sunday. As long as you’ve been practicing deep water (which you should) you generally won’t have to water every day anyways. I prefer a soak hose so just the soil at the base of my plants gets watered and can really soak down to the roots. This also uses way less water and prevents disease often brought on by over head watering or sprinklers. You can also put a timer on your faucet if you need to water every day. Or, a trusted neighbor can turn it on and off for you. How to go on vacation when you have livestock? We make sure their watering containers are large or we have multiples that they can’t tip over. We’ll have multiple watering containers in the chickens coop. We use two large tubs for the cattle and one large tub for the pigs. You can also use automatic waters, but I’d still recommend having someone check on the levels just in case of malfunction if you’re going to be gone more than one night. During the summer months are cattle have plenty of grass so there’s no need for us to supplement their feed. We know how much our flocks eat each day so we can set out extra feeders with enough food to take them through. You can also have someone house sit if you wish. We’ve never went this route but I know others that have. I’m not going to lie and say you won’t ever have struggles. There are some years where the weather just won’t cooperate, you have extra surprises life throws at you, or one of your crops is wiped out with disease and you get nothing. It happens to every gardener at one point or another. A few years ago my zucchini were an epic fail (I know, who has issues with zucchini!). I’m not sure if it was the soil or the seed. The blossoms would begin to form the fruit so I know it wasn’t a pollination issue, but right before they were ready to pick, overnight they turned to a mushy mess. It didn’t seem to be regular blossom rot (which is normally due to a calcium deficiency). Every year I learn something new, but no matter how much of a set back I may have with a crop, we always plant another garden come spring. Because it’s worth it. We shouldn’t be so removed from our food, letting the growing and developing of it solely in the care of others.